The current Pavilion was opened on 8th May 1934. 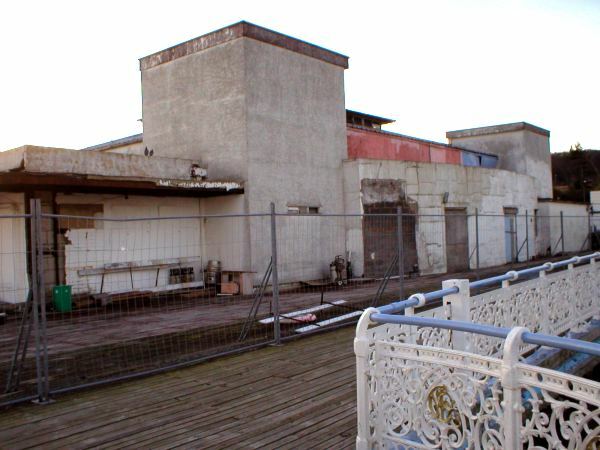 It is a unique construction for a seaside pier building, being in its day at the cutting edge of both building techniques and modernist / art deco design. 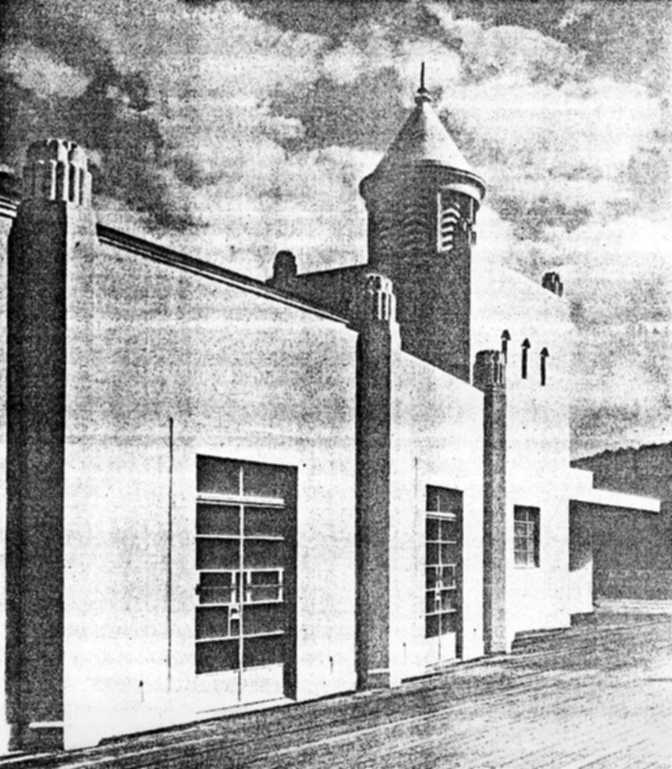 The following text is from an article published in the June 1st 1934 edition of "The Architect & Building News". Please excuse the quality of the photos, they are photocopies of photocopies and will be replaced by better ones when I can find an original copy of the magazine! Architect: Professor S. D. Adshead, M.A., F.R.I.B.A., in collaboration with Mr. W. J. Dunning, M.Inst.C.E. The front of the pavilion faces West over the bay. This new pavilion takes the place of one which was destroyed by fire last year, as also was its predecessor. 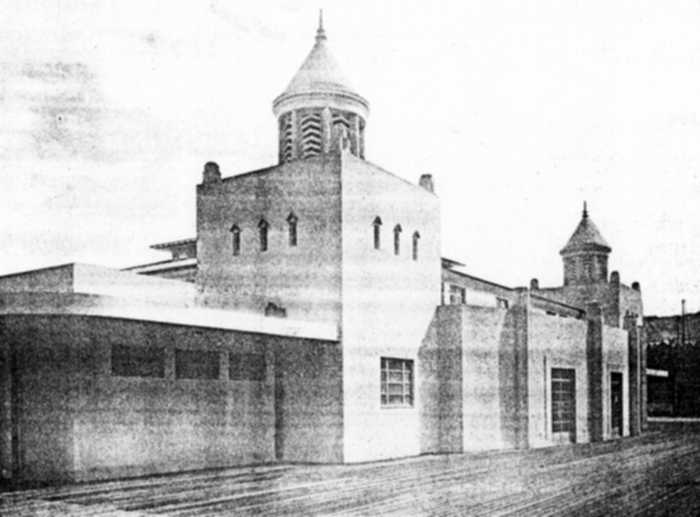 Particular precautions have therefore been taken to make the new building entirely fireproof, and the construction has also been designed to give extreme lightness with protection from very severe weather. This has been effected by a light steel structure, rigidly framed and latticed, the walls and the ceiling being completed over the main iron skeleton by the use of expanded metal lathing on a steel framing. Great care has been exercised in the choice and application of materials so as to compensate in some measure for expansion and contraction. The outside cavity walls are finished on the weather side with coloured cement; on the inner side expanded metal lathing and expansion rods are finished with pumice-stone concrete, the lightness of pumice in comparison with more customary aggregates having weighed with the designers. For the purpose of wall decoration plaster work has been specially treated. The same view in December 2003, a sorry sight. The verandahs are a prominent feature. There is ample projection to meet weather conditions, and, supported by cantilevered steelwork from the main structure, this eliminating support from the deck level, they are without the heaviness so often to be noticed in this type of construction. Asbestos sheeting, supported direct upon the steelwork, makes the main roof absolutely fireproof: the flat roofs of an improved type of reinforced steel decking have the same high fire resisting qualities, while all the windows, doors, and other interior fittings are of metal. The "lay-light" in the ceiling of the auditorium - 30 feet by 12 feet - is entirely suspended from the steel trusses. The maple floors are protected against fire by layers of thick asbestos sheeting. Lavatories, kitchen, store rooms etc., are finished in terazzo and granolithic paving on expanded metal. Lighting and heating have had particular care and attention, the electrical equipment being housed in iron boxes, with the wiring enclosed in galvanised screwed steel tubing, so that there is no risk either of fire or failure of installation. The stage switchboard is fitted with the latest devices for colour control and dimming, and there is provision for flood lighting the exterior of the building. To guard against the possibility of a check of the main electrical supply, there is an auxiliary lighting system connected to storage batteries. Current will be automatically released to pilot lights if for any reason the main supply fails. The special heating arrangements consist of two modern gas fired boilers, from which hot water is circulated through radiators. Many of the pipes are arranged under the pier; others are run alongside the steel roof principals with a view to heating, without obtrusiveness, the upper portion of the hall and preventing downdraughts. An electrically driven accelerator assists the circulation of water. 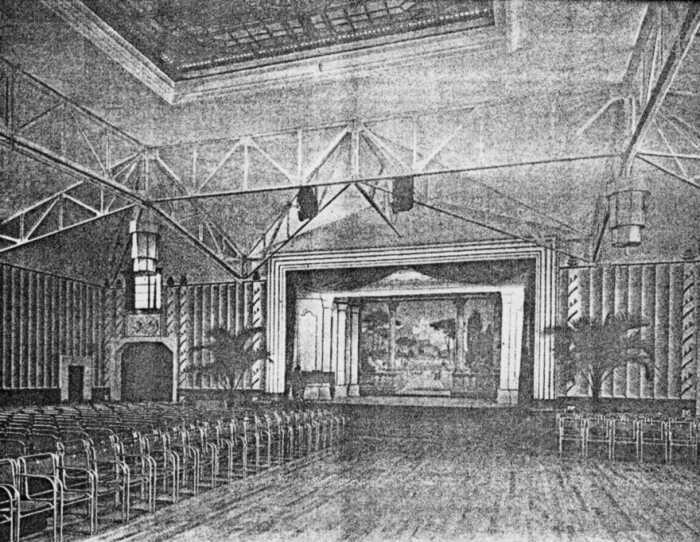 The design for the auditorium, by Mary Adshead (daughter of Professor Adshead), and carried out under her supervision, suggests a tent or marquee supported by ornamental poles and ropes, and decorated with a number of abstract motifs derived from musical instruments and nautical emblems. The colour scheme is grey and white, with some scarlet and yellow, the dado being vivid emerald green in a scarlet and yellow reticulation. The roof trusses are painted white with red lines to harmonise with the design. The proscenium, the doors flanking the proscenium, and the windows are curtained with mole velvet. The doors opposite the proscenium are curtained with green velvet to carry through the scheme of the green dado. Metal frame canvas seats help to convey the idea of a grand tent or marquee. Mr Eric Ravilious strikes an original note in the decoration of the tea-room. The theme represents a scene on the bed of the ocean. Pink and green seaweeds float through the ruins of a submerged palace. The tea-room wall decoration by Eric Ravilious. A study by Ravilious for the mural - note the study differs from the actual mural itself and it also shows two doors - it is possible this could be another mural on the opposite wall, which does have two door ways in it through to the kitchen. The auditorium, which has accommodation for between 700 and 750 people, is equipped with a stage suitable for concert work and light theatrical programmes and has also a floor specially sprung for dancing. Generally this building gives the impression of striking exactly the right note in the architecture of pleasure. There is a stimulating gaiety about exterior and interior and there was much wisdom in placing the main facade West, where it commands the town and bay in just defiance of two unfortunate precedents. The building was designed by Professor Adshead in collaboration with Mr. Dunning, the Engineer to the Council, who undertook the entire superintendence of its erection. Horseley Bridge & Thomas Piggott, Ltd. The auditorium and stage areas are covered by the pitched roof, made of corrugated asbestos-cement sheets. This all needs replacing, having been patched and repaired numerous times. It is currently has a few relatively minor leaks. The two turrets on top of the square towers (which lit up at night) were removed sometime in the late 60's - 70's. Since the original plans no longer survive, drawing will have to be scaled up from photographs in order to recreate these features. The rest of the building has flat roofs which are in various states of repair. 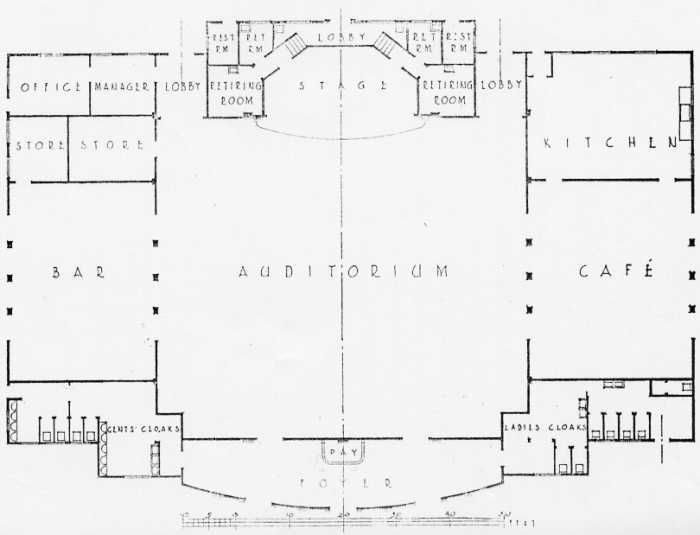 There are serious leaks over the left-hand back-stage areas, the lobby to the right-hand of the stage, and to both the gents and ladies cloak rooms. These need urgent repair. The entire roof needs replacing, but some areas should remain water-tight for a couple more years with basic regular maintenance. During the late 1960's refit, almost the entire outside of the building was clad with 2" square timber, wire mesh and rendered. All the windows and most of the doors were blocked off. This has helped to protect some of the walls to an extent, but in other areas the rain has got between the cladding and the original walls causing serious damage as the dampness lingers and cannot dry out in fine weather. All of the exterior needs to be stripped back to the original in order to see what needs to be done. The major problem here is that the original steel laths beneath the render have corroded causing the render to crack, letting in further moisture and so the problem accelerates. Some of the original doors and windows survive, some have been lost. Exact copies will be made to replace those missing. The original bar fittings have all been lost, and currently I do not have a single photo or description of how this looked. Careful searching may reveal marks in the structure to at least get an idea of the original layout. In the event that nothing can be found, a new bar will be designed appropriate for the building. A suspended ceiling was fitted over the entire auditorium during the 60's refit. Workmen simply smashed holes through the beautiful stained glass ceiling to install the ceiling hangers. This was pure vandalism - the entire glass area is in small sections, and could easily have had the necessary panels removed and simply left in the roof space, but I suppose that wasn't so much 'fun' as throwing a hammer through it. The walls were all clad over with false arches and pilasters, and the original stage proscenium completely obscured. The top and left hand side of the plaster proscenium survived intact beneath all the rubbish, but for no obvious reason, the right hand side has again been smashed in. The back-stage areas all survive intact, even down to the mirrors on the dressing room walls. However, due to the rain coming into these area for many years, they are in a very poor state of repair. Most of the lovely maple dance floor survives, although some years ago vandals tried to set fire to the building, and since it is fireproof, all they managed to do was burn two holes in the floor. The previous owners converted the tea room into a flat, and this is where I also currently live most of the time. Because of this, the area is in reasonably sound condition. The original art deco linoleum floor survives intact as far as I can see. The bulk of it is a marbled pinky colour, with a large circular design in greens and black, reflecting the colour scheme of the Ravilious murals which still survive under all the layers of wallpaper, plaster and paint that have been applied over the past 77 years. Apart from a few small drips, the Pavilion had been made weatherproof as at July 2008. 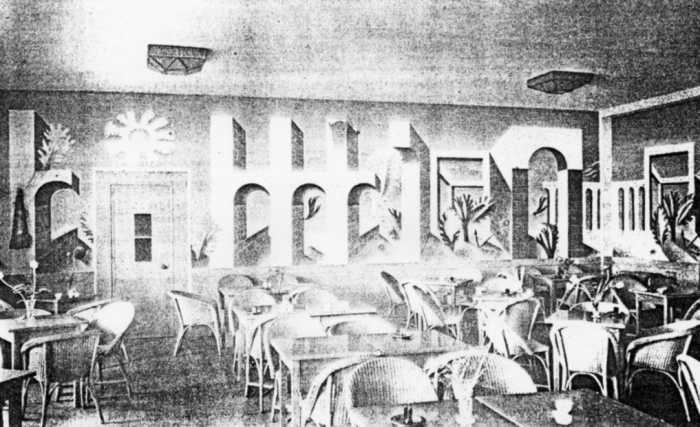 All of the 1960's refit had been ripped out to once again reveal the original Art Deco layout of the building. Restoration had commenced on the amazing glass ceiling, and exploratory work had begun on revealing the important murals. However, the wilful neglect by Royce Peeling Green Ltd from when they took over as trustees in July 2008 to the present day has seen all of that hard work go to waste. It is vital to make this building weatherproof again as soon as possible to protect the original features until the building can be fully restored to its former glory. My intention remains to see this fantastic, under-appreciated building restored to how it looked on the day it opened - May 8th 1934 - from the the great big illuminated zig-zag turrets right down to the door knobs.